This is the fourth part of a short series about auto responders in Mailster. What are action hook auto responders for? The content of you campaign mostly rely on it’s purpose. Just in any other campaigns you can use modules, tags and custom html. Select the Auto Responder tab in the Delivery Meta box. 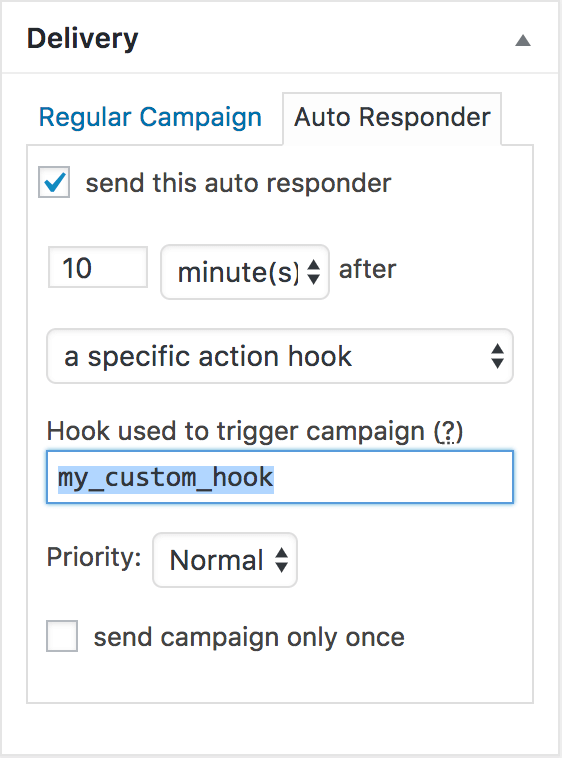 From the dropdown switch to “a specific action hook” to trigger the campaign when a certain action (“my_custom_hook” in our case) is executed. The delay (10 Minutes) is for when the mails for the campaign are queued. If our action hook is called at 12:00pm mails for this campaign are scheduled for 12:10pm. The Priority defines how quickly mails get sent. This is useful if you have many campaigns and mails queued and like to push them up in the queue. If you “send campaign only once” each of your subscriber will get this campaign only once, no matter how often you trigger “my_custom_hook“. If you uncheck this option every time the hook is called mails will be added to the queue but only if they are not already queued. All subscribers must match the conditions in the receivers meta box! Read more about how to get the ID of the current subscriber here. Based on the above settings and by using the custom action hook “my_custom_hook” here are some examples to get started. (Read more about adding custom code to your site here). This triggers the campaign for the current user on the page with the slug “sample-page”. This triggers the campaign after the user has successfully logged in.